The Woolworth Building soars above City Hall Park at the gateway to TriBeCa. 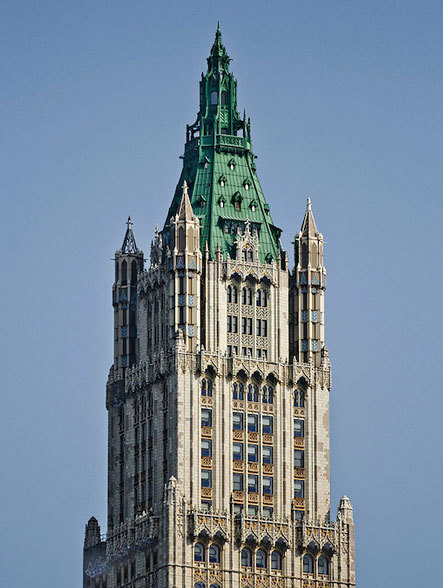 Unprecedented in size and sophistication when it was first completed in 1913, this graceful tower remains an elegant jewel in the skyline of downtown Manhattan. Today, the top thirty floors are being masterfully transformed by famed French architect Thierry W Despont into The Woolworth Tower Residences: a limited collection of thirty-three luxury condominium residences atop a celebrated New York City landmark. Please complete Notice of Intention to Sell (enclosed). Notice to the Board of Managers of The Woolworth Tower Residences c/o Douglas Elliman Property Management stating that you have received a bona fide offer to purchase your unit. Said notice must include the name and address of the party making the offer to purchase your unit, and the terms of the proposed transaction. The giving of such notice to the Board shall constitute an offer by you to sell your unit to the Board or its designee. Upon the same terms and conditions as contained in the proposed contract and shall also constitute a warranty and representation by you that you believe the offer to sell your unit to be bona fide in all respects. Please upload Fully Executed Contract of Sale signed and dated by all parties. Please complete Purchase Application for Waiver of Right of First Refusal (enclosed). Please complete Financial Statement and Itemized Schedules (enclosed) complete with the most recent month of supporting statements. In the event that a corporation is purchasing the unit, the statement must be on the corporation. Please upload Employment Verification Letter stating position, salary, and length of employment; if self-employed, letter from CPA stating past and anticipated annual income. Please upload the past 30 days paystubs for each applicant. Please upload each applicants most recently filed Federal Income Tax forms (Form 1040) along with any W-2s, 1099s and applicable schedules. Please complete Tenant Data Credit Report Authorization Form (enclosed). Please upload Landlord/Managing Agent Reference Letter. Please upload three (3) personal reference letters per applicant. Please complete Window Guard Form (enclosed). Please complete Residential Rules and Regulations Acknowledgement (enclosed). Residential Rules and Regulations enclosed for informational purposes. Please complete Notification of Unit Owners Legal Mailing Address (enclosed). Please complete Emergency Contact Form (enclosed). Please complete Right of Access Form (enclosed). Please complete Lead Forms (enclosed). EPA Lead Pamphlet enclosed for informational purposes. Please complete Notice of Intention to Lease (enclosed). Notice to the Board of Managers of The Woolworth Tower Residences c/o Douglas Elliman Property Management stating that you have received a bona fide offer to lease your unit. Said notice must include the name and address of the party making the offer to lease your unit, and the terms of the proposed transaction. The giving of such notice to the Board shall constitute an offer by you to lease your unit to the Board or its designee. Upon the same terms and conditions as contained in the proposed lease agreement and shall also constitute a warranty and representation by you that you believe the offer to lease your unit to be bona fide in all respects. Please complete Lease Agreement (enclosed). Please complete Lease Application for Waiver of Right of First Refusal (enclosed). Please complete Sprinkler System Disclosure Form (enclosed). Please complete Tenant Data Verification Co. Credit Report Authorization Forms (enclosed). Please complete Bedbug Disclosure Form (enclosed). Please upload a letter addressed to the Board of Managers requesting to renew the existing lease. You can view or download each form by clicking on the respective form in the above window. Brokers: You and your invited collaborators can easily upload, fill-in, edit, and sign these forms and external documents in a Custom Package.